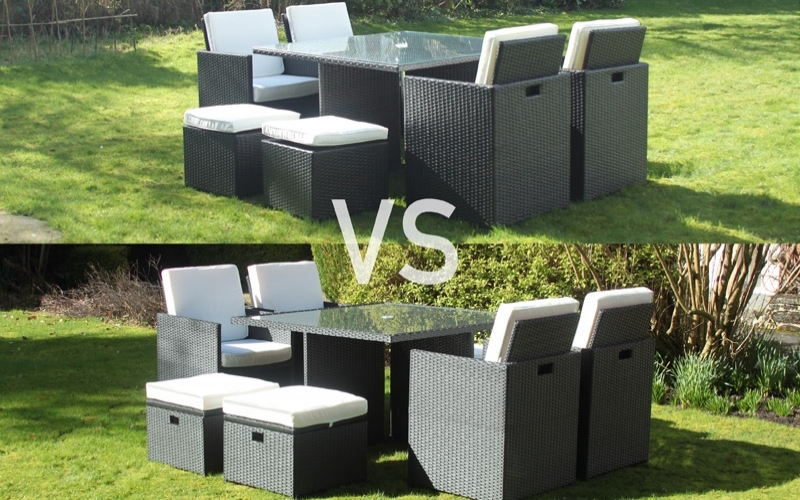 Interested in our fantastic Rattan Cube sets? Yes! But which one? Deluxe? Or Premium? We have designed 2 amazing Rattan cube sets mainly to suit our customers budget and requirements. In this post we out line the main differences of these two sets. The Premium Rattan Cube Set is where it all began for Harts. We wanted to design a rattan furniture set that was practical for the outdoors and easy to maintain. With quality weather resistant rattan and an aluminium frame we designed our furniture to last. We also minimised the use of fixings such as bolts so the cube set comes fully assembled. We looked at our competition and see that many of the garden furniture sets are Steel, which means over time the furniture would rust and make a mess on your patio floor. For us, this is simply unacceptable and false economy because ultimately, the furniture will not last. A lot of the rattan furniture on the market is made from thin pe rattan or even PVC rattan. This cheap rattan generally only last 2 years and can melt quite easily in the extreme heat. We use a strong PE rattan which is thicker and designed to last longer. 1.2m x 1.2m table with a 6mm glass top. 1 of the Stools open up as an ice bucket for drinks. Parasol hole with Parasol attachment at the bottom. Cushions that can be wiped clean & Machine washable at 30 degrees. If you have any further questions on our Rattan cube set please feel free to contact us.